There's a new way to save for retirement, and it's specifically for Americans who don't get a 401(k) or pension at work. The Obama administration launched its "myRA" retirement account program nationwide Wednesday, after nearly a year-long pilot program. It targets low- and middle-income Americans who haven't yet started saving for retirement. Saving is hard to do without help from your employer. And about half of all workers don't get a 401(k) or pension at work. Many part-time workers and those at small businesses are on their own. While people without a workplace plan can also open an account like an IRA, the federally-backed myRA is less risky. How will the myRA account work? There are three ways you can put money into your account. 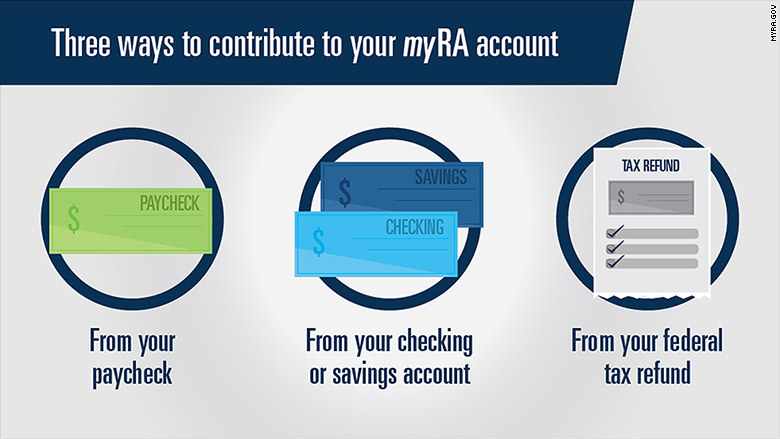 You can transfer after-tax dollars from your paycheck directly into your myRA if your employer offers direct deposit. You can link it up with your checking or savings account and schedule one-time or regular contributions. Or, you can direct some of your federal tax refund to the account. Why open a myRA account? You won't incur any fees, there's no minimum balance required, and the principal amount is guaranteed by the government. So you'll never lose any of the money you put into it. What's the catch? The money is invested in a super-safe Treasury Securities Fund. It offered a return of 2.3% last year, and 3.2% over the last decade. That's better than a typical savings account, but less than what a riskier investment might make. While you can withdraw the money you put in, you will be penalized if you take out any of the earnings from interest before turning 59½, just like a regular Roth IRA. There are some exceptions, such as using the money to buy a home or to pay for some higher education expenses. What are the limitations? You can only open a myRA if you earn less than $131,000 if single, or $193,000 if married. And you can only contribute up to $5,500 per year, or $6,500 a year if you're age 50 and older. You can also have an IRA or Roth IRA account, but your total contributions to all of your IRA accounts cannot exceed those limits. The amount you can save in your myRA is capped at $15,000, and you can not have it open for longer than 30 years. At that point -- whichever comes first -- you must transfer your money to a private-sector Roth IRA. Visit myRA.gov or by calling 855-406-6972 to get started. Are you considering opening a myRA account? Email Katie.Lobosco@cnn.com to share your story.